Once upon a time, a sage was living in a temple. The village near the temple was a prosperous one and hence the sage had no shortage of food and clothes. Most of the villagers always came with some or the other things as donation for the sage. The sage also used to give his heartfelt blessings to the devotees. After finishing his dinner, the sage used to keep the excess food in an earthen pot and hung it high from the roof. Life was going on at its usual pace for the sage but for the last many days something strange began to happen. Every night, a rat used to steal the food from the pot which was suspended very high in the air. The sage was highly surprised because it was not possible for any normal rat to jump so high. 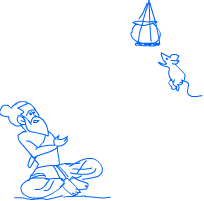 The sage discussed the matter with one of his friends and then both of them wanted to find out the secret which gave so much power to the rat. His friend said that they should dig the rathole and find out what was behind the mysterious power of the rat. When they dug up the hole, they were highly surprised. They found a big lump of gold hidden in the hole. The sage then came up with a very good logic. He said that since the rat was sitting on so much of property, he was highly confident to do what the normal rats could not even think of. They removed the lump of gold from there and deposited it in the royal treasury. After that, the rat could never jump so high to steal the food.